Utilizing an STM stepping motor, this lens is ideal for both still and video shooting due to its speedy and smooth operation. Further benefitting video shooters, the STM motor also supports the Movie Servo AF mode on select DSLRs for precise and near-silent focusing. Sigma telephoto lens with case. In good condition. This came with a Minolta X300 camera which I have listed seperatley. 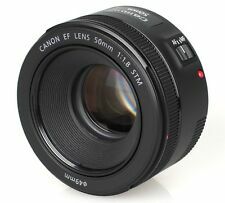 Canon EF 50 mm F/1.8 EF STM for Canon - Super Condition. Comes with both end caps & Lens hood Dispatched with Royal Mail 1st Class. Good condition with Sigma case (which is a good fit for it). Olympus M.Zuiko 40-150mm F4-5.6 with UV filter, boxed and in mint condition, everything works as it should. Used but well looked after. 55-210mm Sony E Mount Lens. Canon EF 70-300mm F/4-5.6 IS USM Lens. The lens is in the good used condition. The autofocus ring clicks a bit and rarely requires a slight manual rotation to continue autofocusing. Does not affect operation or optics quality which is excellent. Please check photos and double-check description with the lens label on the photo. This lens is in very good condition throughout and full working order with no faults. This is theNikon 70-300mm F4-5.6 G Autofocus Zoom Lens. Nikon D40 / D60. Nikon D3000, D3100, D3200, D3300, D3400, D3500 i.e D3XXX series. Vivitar Series 1 100-400mm/f4.5-6.7 Auto Focus Lens, Boxed. Condition is New. Dispatched with Royal Mail 2nd Class. Nikon Nikkor AF G 28-100mm. f/4.0-5.6 AF G Lens. Nikon D40 / D60 / D3000 / D3100 / D3200 / D5000 / D5100 / D5200 etc models. SUPERB CONDITION FILM & DIGITAL. This lens produces very sharp images and is in full working order. Nikon Nikkor AF-S 85mm F/1.8 AF-S Lens. Condition is Used. Cracking lens, works perfectly. Boxed, with lens hood, pouch and cap. 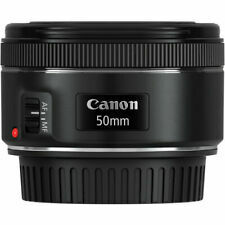 Canon EF 50 mm F/1.8 EF STM for Canon - Black. Condition is Used. Dispatched with Royal Mail 1st Class. Great unmarked condition. I used to have the non-stm version but got this for the smarter STM focus. It's cheap, but good. Comes as shown with lens hood. Don't have the box for this one but I'll pack it securely for postage. Canon EF 50 mm F/1.4 EF USM lens with hood in excellent condition Clean and fast aperture. Unmarked. Comes without original box but both caps. Please note the hood is an aftermarket item. Nikon AF-S Nikkor Lens. 18 - 200mm 1:3.5 - 5.6 G II ED DX Lens. Lens is in good condition. We aim to ensure you receive your goods promptly and safely. We will check any reported faults. Our Products. Canon EF 70-200mm F/4 USM Lens. Condition is Used. Excellent condition. Used only but a few times. Case, hood and cap supplied. No box. PENTAX Pentax HD DA 55-300mm F/4.0-5.8 VR ED Lens For Pentax. In used but very good condition. I don't have the box or papers for this lens. No scratches on the lens.. Dispatched with Royal Mail 1st Class. 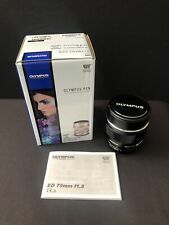 Canon EF 50 mm F/1.8 EF STM for Canon - Black - BOXED MINT CONDITION!! 5 out of 5 stars - Canon EF 50 mm F/1.8 EF STM for Canon - Black - BOXED MINT CONDITION!! 97 product ratings97 product ratings - Canon EF 50 mm F/1.8 EF STM for Canon - Black - BOXED MINT CONDITION!! Canon EF-S 18-135mm f/3.5-5.6 IS STM Lens Boxed and Hood. Condition is Used. Dispatched with Royal Mail Signed For® 2nd Class. Canon 2044B002 EF-S 55-250mm F/4-5.6 II IS Lens. Condition is Used. Dispatched with Royal Mail 2nd Class. Good condition. Had this a few years and taken some great wildlife shots. It's the earlier non-STM version. No box but will be packed securely. Check out my other canon gear. Sigma 150-600mm f/5-6.3 DG OS HSM Lens for Nikon F. Condition is Used. Lens is in mint condition and is complete with camo cover/protector. Both end caps. Lens hood. Sigma carry case/protector and 95mm ultra violet lens filter/protector. All manufacturers instructions and original box. Comes as a bundle with a Manfrotto carbon fibre monopod, again in mint condition. Inspection welcome but will post. Value dictates insurance and 48 hour signed for delivery - hence price. Vivitar 70-210mm Macro Focusing Zoom Lens. Macro focusing auto zoom (VMC). Highly collectable. Looks in clean condition, but sold as seen. NIKKOR 80TH ANNIVERSARY | NIKON. SWM (Silent Wave Motor) enables quiet automatic focusing with quick and convenient switching between autofocus and manual operation. Excellent condition - hardly used. This is a great all round lens perfect for sports and wildlife photography. The pictures show quite clearly what the lens is and that its the IS II version. Canon EF-S 8546B002 55-250mm f/4-5.6 STM IS Lens. Condition is Used. Brilliant 24-85 mm VR Lens - barely used. Hello and thanks for looking. You are buying a used Nikon 24-85 AF-S FX VR f/3.5-4.5 ED zoom lens, complete with front and rear caps and lens hood. The lenses condition is used but in very good conditions n. It works perfectly and has been well looked after. The zoom slides smoothly from one end to the other, and works fine on both manual and autofocus. The VR function works perfectly too. These are superb lenses with a x 3.5 zoom factor for a very reasonable price. They sell for over £580 new on Amazon, and get 4.2/5 stars. It will be delivered for free anywhere in the UK by trackable courier, or extra for Royal Mail first class recorded or guaranteed next day delivery. A bargain at 99p starting bid and no reserve, happy bidding! You will hear the audible "beep" and the viewfinder. A Canon Eos M42 adaptor with FOCUS ASSIST CHIP. Canon Eos 200d. A Canon type rear protection cap. Everything is there for you to fit to your Canon and start taking photos. Canon EF-S 55-250mm f/4-5.6 STM IS Lens with Box & Hood. Condition is Used. Dispatched with Royal Mail Signed For® 2nd Class. Condition is Used. Used only twice. As good as new. Works as it should. Sirius MC Auto 70-210mm 1:4.0-5.6 Zoom Lens No 877366. Condition is Used. Dispatched with Royal Mail 2nd Class. Nikon 18-200mm f/3.5-5.6 AF-S VR DX Lens. The lens is in excellent overall condition showing minimal signs of use (see pictures). Functionally the lens is in full working order; optically, the lens is in great condition. All the details are here Excellent working condition with Hoya UV(0) as protection which has been on since new. See also my carry bag compatible with this lens, and my 35mm lens for sale.